I'm quering a MySQL database and use a script to put results into an automatically generated HTML-file. I have two tables with 2 columns and 4 rows each that need to be put side-by-side. I have put my html & css in fiddle. 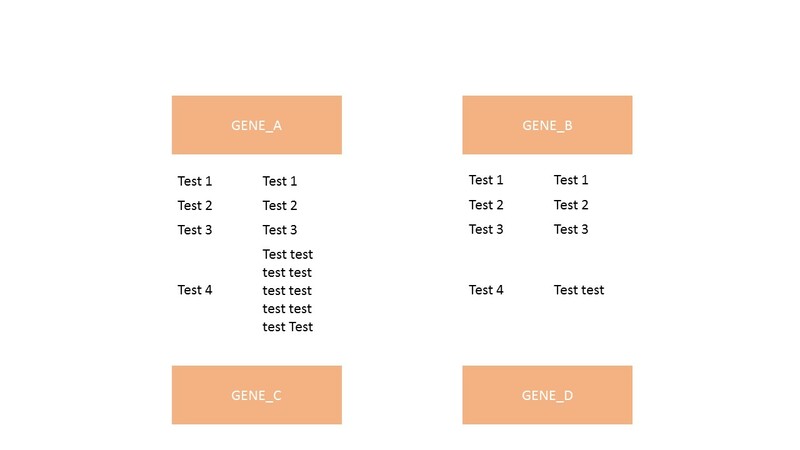 Now these html will be automatically generated so the table for GENE_A_TEXT and GENE_B_TEXT will never contain the same information and so will also not be of the same heigth, as can be seen in the example (because of test4 row). Okay so I have made a few assumptions to create this solution. Firstly, I'm guessing that as you are setting the headers of the tables as width:200px; that the width of the two columns are 100px. (This can be changed if need be). Secondly, these tables are not floated. This means you will not get desired behaviour with the rest of your content if that was desired. -Cannot be changed very easily. And finally, you need the empty <td></td> 's in after the first table. I used this as a filler to get a floating effect. This cannot be changed without using a different approach.